British designer Lee Broom has opened an exhibition of his run called Park Life, in a car park beneath the Space Furniture showroom in Sydney. The exhibition is contained within a white polycarbonate box inside the raw 370 -square-metre concrete space. It showcases to showcases more than 100 individual suns by the designer, along with other works. 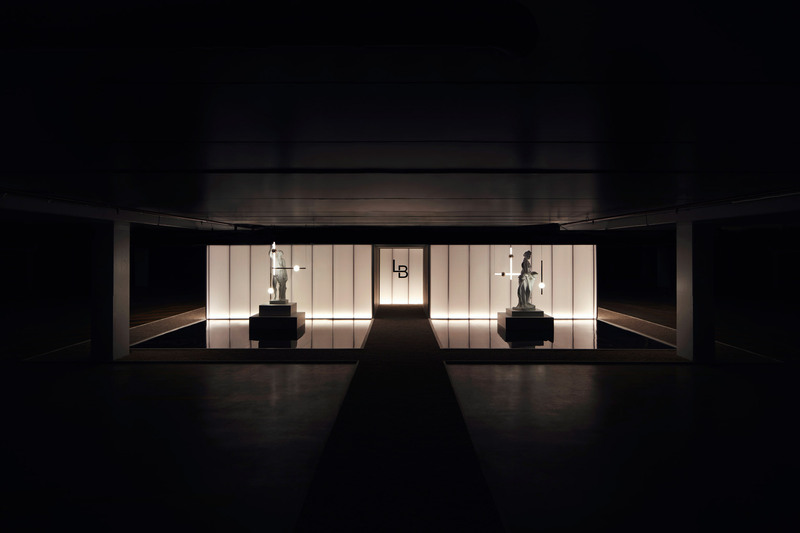 The car park provides an industrial backdrop for a number of lighting and furniture pieces interspersed with classical statues on plinths, in a range of interconnecting spaces. 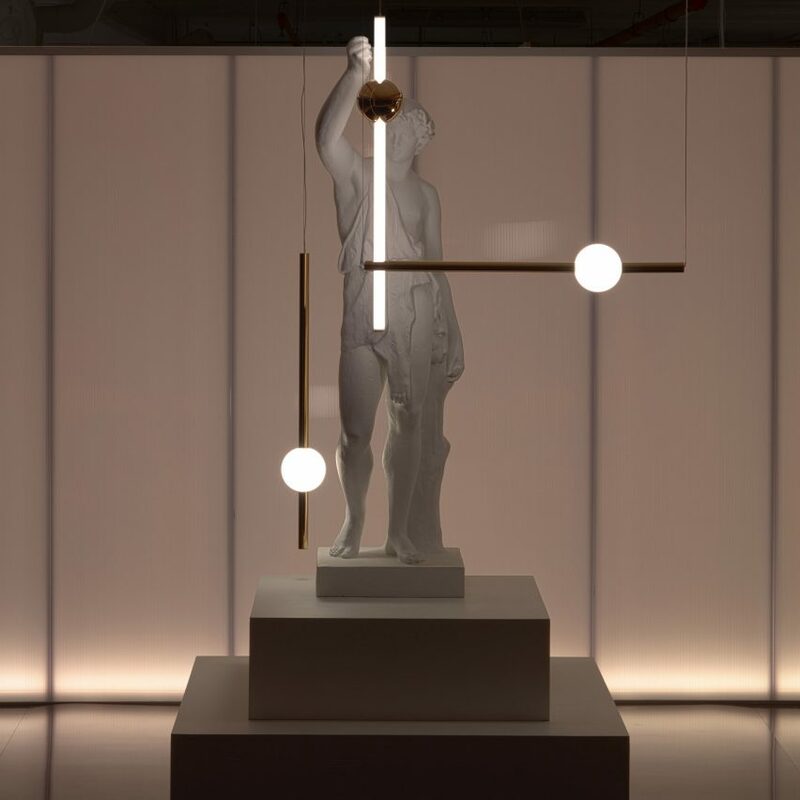 “Taking the form of a labyrinth, Park Life will take guests on a poetic journey of discovery through concealed passageways, with tableaus and vignettes showcasing the brand’s lighting, furniture and accessories in a whole new sun, ” said the brand. Broom was inspired by 18 th-century pleasure gardens as places of “escapism, amusement and drama” when conceiving the exhibition. A path of white gravel leads towards the entryway of the exhibition, flanked on either side by two classical figures. 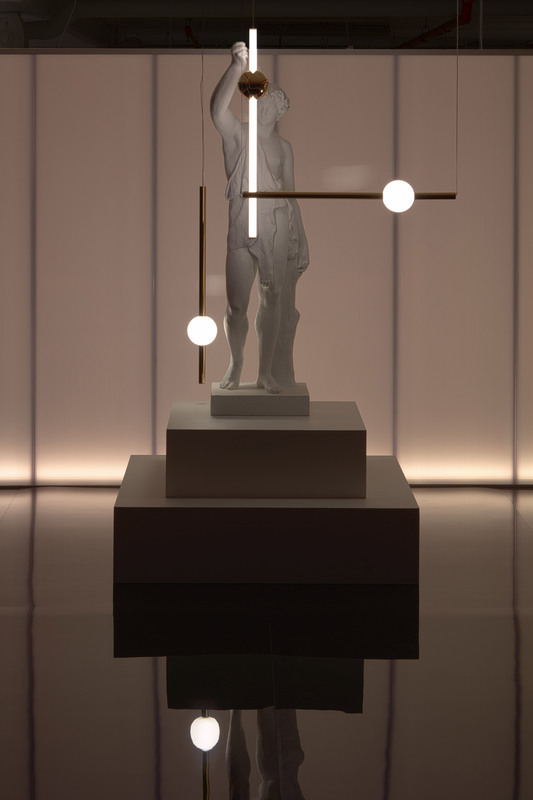 One of the statues is holding Broom’s Orion tube light with the Orion globe light hanging in front of it, with the same suns hanging in a different configuration behind the other. Both figures are installed on squares of black acrylic that reflect like ponds of water. Once they enter the white box, visitors must find their way through a maze of connected rooms designed to deliberately disorientate, with mirrors and secret doorways. In each space, products designed by Broom are arranged in clusters. 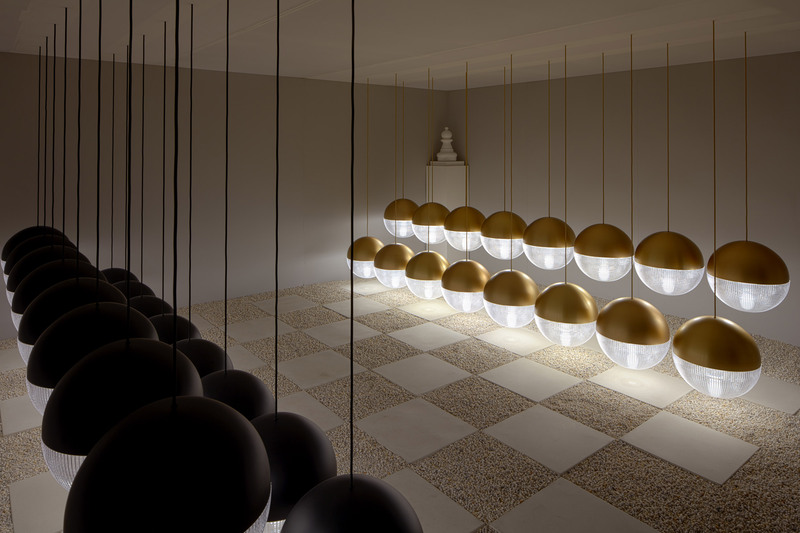 In one region, the Lens Flair pendant illuminations are installed as “chess pieces” with 16 lights in a matt black finish hanging opposite the same number in a brushed brass finish, above a “chess board” of white gravel and stone squares. 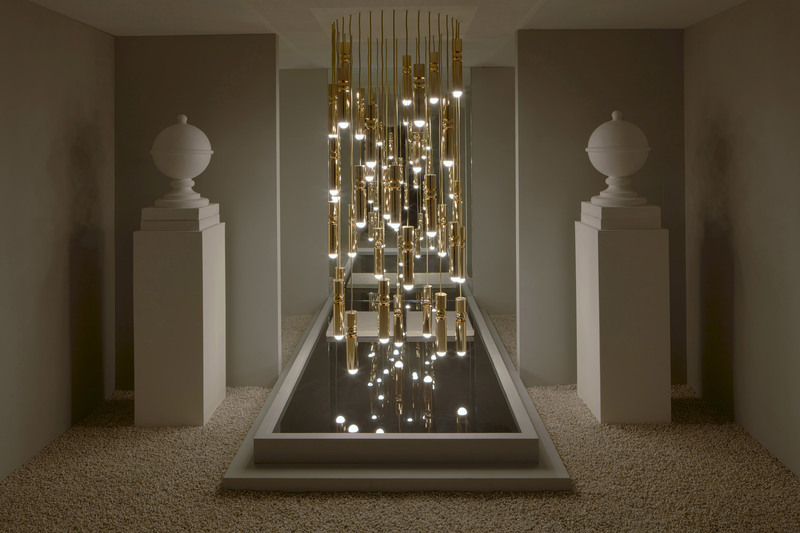 Further on, a cluster of the designer’s Fulcrum pendants in polished gold cascade from the ceiling with white globes standing on plinths on either side. 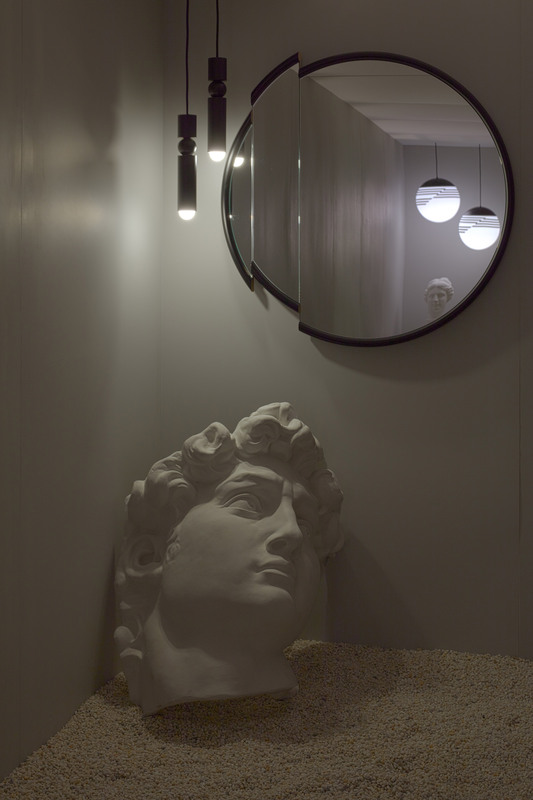 Elsewhere the Split mirror and black fulcrum pendant are placed above an outsized classical bust that leans in one corner, whilst the Ring light and two Optical pendant illuminates hang in other nooks of the maze-like space. 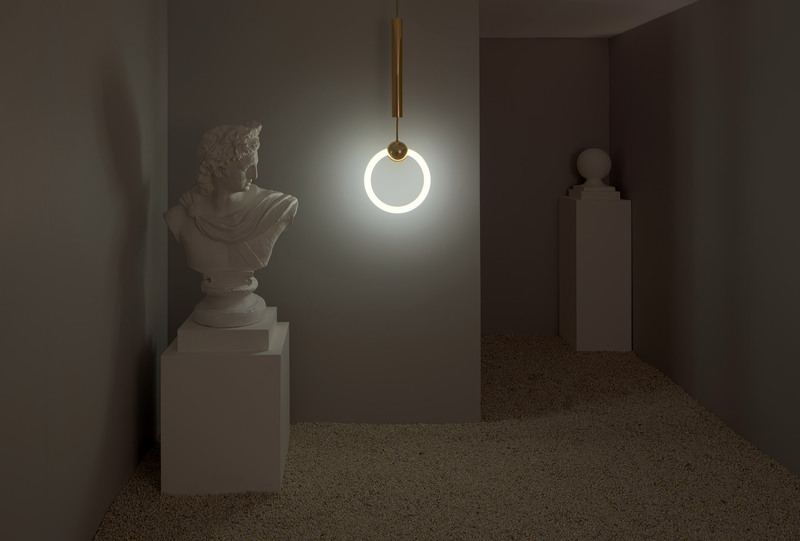 The exhibition also marks the debut of a version of Broom’s Eclipse light, available as a pendant, chandelier and table lamp with a polished gold finish. Park Life forms part of a series of events for the brand in Asia, Australia and New Zealand during the month of March, including talks in Singapore and Melbourne as part of their respective design weeks. Broom has taken the decision not to show at Milan Design Week 2019, after a presence at the fair since 2012 that has included depicting his run against a backdrop of blooms, as well as in the back of a delivery van and a show last year inspired by outer-space. The brand told Dezeen that the decision was not inspired by Brexit, but instead a desire to step away from the fair this year and reach their customers in a different way, with Asia and Australia increasingly an important audience. “Australia and Asia are important markets for the brand and due to timings and scale of the Sydney presentation, we decided not to exhibit in Milan this year, ” said Broom in relation to the brand’s plans. Park Life runs for two weeks from 13 March 2019. 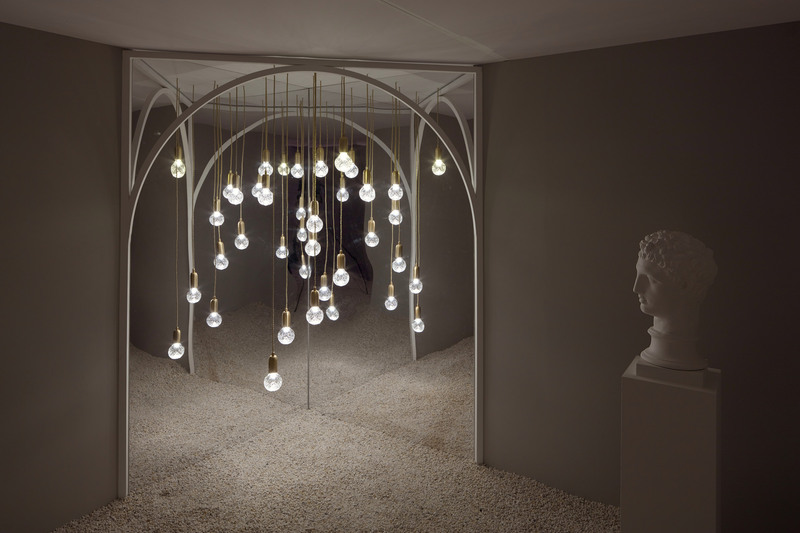 The post Lee Broom presents over 100 suns with exhibition in a Sydney underground car park seemed first on Dezeen.